U.S. stock futures are pointing to a steady to slightly positive open but currencies are still reeling from last night’s sell-off in Asian equities. Chinese stocks dropped more than 1% as ongoing concerns about U.S.-China trade tension continues to pressure the markets. The Yuan resumed its slide despite mixed Chinese trade data -- the trade surplus declined but exports and imports increased. All of the Japanese Yen crosses are trading lower, led by the decline in USD/JPY. Now that 111 has been broken, the main levels to watch are 110.80 (50-day SMA) and 110.60 (July 26 low). The weakest currency is sterling which fell to a fresh 11 month low today. GBP/USD has not seen a rally in 7 trading days and with no data to support the currency, investors are focused on the growing risk on a no-deal Brexit. The greenback is mixed and a quiet data day means risk on/risk off will drive dollar flows. EUR and AUD are flat but there’s a good chance that we could see some weakness in the NY session. NZD on the other hand should be quiet with the RBNZ rate decision tonight whereas USD/CAD could struggle underneath 1.31. China rolled out $50B in tariffs overnight, sending USD/JPY and risk appetite plunging lower. While the greenback has not fallen across the board (it is up versus GBP, AUD and CAD), it is certainly vulnerable to additional weakness in the NY session as Dow futures, which are down 500 points signal a very ugly open. The U.S. is stirring up the trouble so the greenback will be punished but risk aversion makes it difficult for other currencies to extend their gains as well. This morning’s non-manufacturing ISM and ADP reports will still have an impact on the greenback but at this point, it may be a sideshow to trade tensions. Next to the yen, the New Zealand dollar is the best performing currency, rising on the back of AUD/NZD flows. The Australian dollar is down slightly with weaker building approvals offset by stronger retail sales. Australia is also particularly vulnerable to China’s troubles. 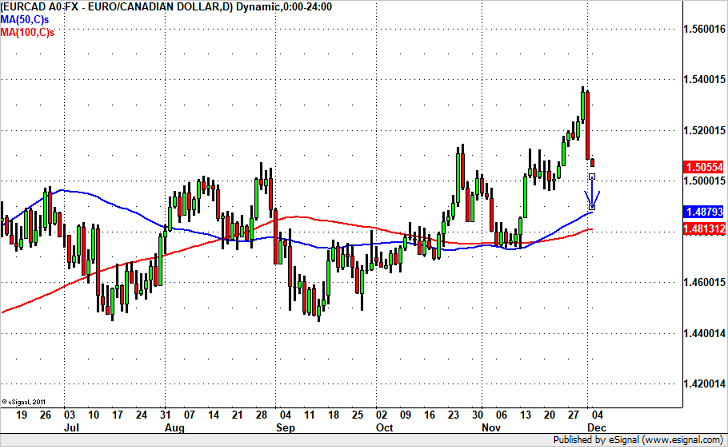 USD/CAD should rise further as oil prices continue to fall. Euro is up thanks in part to a higher CPI estimate. All of the major currencies sold off against the U.S. dollar today but the Canadian dollar was unusually resilient in the face of sharply lower oil prices and reports of significant gaps between the U.S. and Canada from Canadian NAFTA negotiator Verheul. The only explanation is the prospect of stronger Canadian GDP tomorrow. Retail sales and trade activity improved significantly in the month of January, pointing to a faster growth. If GDP surprises to the upside, the best currency pair to trade could be EUR/CAD because Eurozone data has weak and the ECB has been slow to adjust their forward guidance. Technically, EUR/CAD has fallen back below the 20-day SMA and is now poised for a move down to the March low of 1.5760. So far, it has been a quiet morning in the FX market with the U.S. dollar trading lower against all of the major currency pairs except for the Canadian dollar. U.S. stock futures are pointing to a higher open after Friday’s strong move but investors are reluctant to buy into the rally with a comparatively quieter economic calendar this week. There was zero data released overnight but a possible corruption scandal in Prime Minister Abe’s administration weighs on the yen crosses but its not clear whether USD/JPY has the momentum to extend lower especially with stocks pointing higher. The euro looks heavy and eyeing a move below 1.23. Sterling still has a lot of resistance at 1.39 and the commodity currencies are the best performers with the New Zealand dollar leading the gains. If the price action in the FX market on Monday can be characterized by consolidation, the last 12 hours is best described by the word volatility. The dollar rallied hard during the Asian trading session into Europe but collapsed sharply after the London open. It is trading heavily as the NY session begins but trying to recover its losses as pairs like EUR/USD appear to be topping while USDJPY and USDCAD appear to be bottoming. There’s been zero fundamental catalyst but for the past few weeks its lived up to its title of Turnaround Tuesday. We’re also nearing the end of the month and after some very strong moves in currencies, portfolio rebalancing could be affecting FX trade. Eurozone data was mostly in line with expectations with the EZ economy expanding by 0.6% in Q4. UK mortgage data was slightly weaker. Consumer confidence and house prices are scheduled for release this morning but the main focus will be this evening’s State of the Union Address by President Trump -- traders may look to unwind positions ahead of this big event. For the Canadian dollar, all of the past week’s losses were recovered in one day on Friday on the back stronger than expected GDP and employment numbers. It was the best day for the loonie in more than 8 months and a large part of that has to do with how these reports will impact the Bank of Canada’s economic assessment next week. With more than 79K jobs added in the month of November, Canada experienced the strongest period of job growth in 4 years. Full time and part time work increased, driving the unemployment rate to its lowest level to its lowest level since February 2008. While GDP growth slowed in the third quarter, the robustness of the labor market and stronger than expected GDP growth in September completely overshadowed the report. The Bank of Canada has less to worry about in December than in October because everything from retail sales, to the labor market, housing market, manufacturing activity, trade and oil prices improved since the last meeting. The only area that deteriorated was inflation. 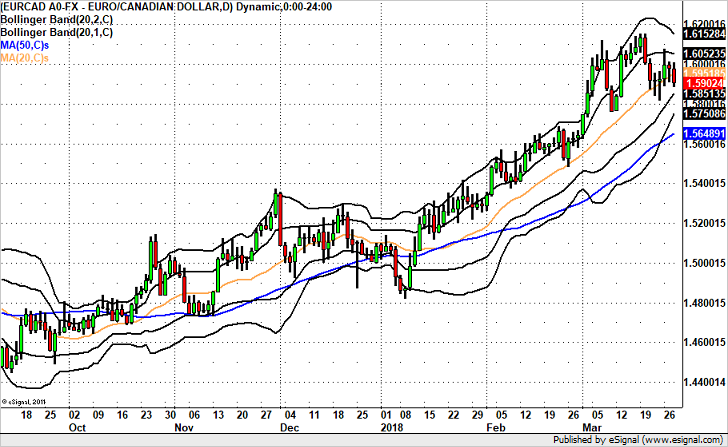 While that is also a big focus for the BoC, we expect the Canadian dollar to trade higher into and possibly following the rate decision. We think its strength will be particularly pronounced against the euro which continues to struggle with political troubles. . German Chancellor Angela Merkel wants to form a coalition government with the Social Democrats but the leader of the SPD party denied talks. Technically, EUR/CAD collapsed on Friday and such a strong move generally has continuation. At minimum we expect EUR/CAD to break 1.50 and hit 1.4960 but the sell-off could easily extend to the 50-day SMA near 1.4900.